As the current exhibit OK, I’ll Do It Myself: Narratives of Intrepid Women in the American Wilderness at the Kislak Center attests, the Penn Libraries’ Caroline F. Schimmel Fiction Collection of Women in the American Wilderness is a wide-ranging one. Aphra Behn and Willa Cather sit cheek-by-jowl with Betsy Bell and Mary Harwell Catherwood; anthologies of Native American folklore occupy the same shelf as a novel about Japanese mail-order brides. The collection is also rich in juvenile literature, from classics like Marjorie Kinnan Rawling’s Yearling and L. M. Montgomery’s Anne of Green Gables to picture books, readers, and series both familiar (The Bobbsey Twins, Nancy Drew) and largely forgotten (The Motor Maids, Three Vassar Girls). Even when the stories are formulaic, the authors’ lives seldom are, as a glance at the careers of Mildred Wirt Benson or Elizabeth Williams Champney demonstrates. Such is no less true of Marjorie Vetter (1898-1977): author, editor, reviewer, and—as a result of sexist twentieth-century immigration and nationality laws—an American citizen twice over, both native-born and naturalized. On the weekend of August 11-12, 1945, mere days after the nuclear strikes on Hiroshima and Nagasaki, the United States released the first thousand copies of A General Account of the Development of Methods of Using Atomic Energy for Military Purposes. * Written by Princeton University physicist and Manhattan Project contributor Henry DeWolf Smyth, it had been commissioned in the spring of 1944 by General Leslie R. Groves, head of the Project, and its purpose was twofold: first, to inform “men of science in this country” about nuclear military technology in order that they might “help their fellow citizens in reaching wise decisions” in the future (Smyth, Atomic Energy 226); second, “to say as much as possible [about the Manhattan Project] in an official statement carefully prepared and reviewed and then to instruct people on the project to say nothing more even after they had left the project” (Smyth, “Smyth Report” 180-181). On September 15, a small but canny group of booksellers began offering for sale the Princeton University Press edition of the report, now titled Atomic Energy for Military Purposes: The Official Report on the Development of the Atomic Bomb Under the Auspices of the United States Government, 1940-1945. The book became an unlikely bestseller: according to Princeton University Press director Datus P. Smith, from 1945 to 1973 the Smyth report (as it came to be known) sold over 125,000 copies domestically, and though “neither Harry Smyth nor the Press had any systematic way of keeping track of translated editions … we had some kind of evidence of translations into about 40 languages” (Smith 199). Janeites unite to remember an amazing woman! Almost every day as I drag myself out of bed (I am not a morning person), I wish that I could spend the day curled up with a book and a lovely cup of coffee. Today, however, I am recommending that we all take at least a few moments, select our favorite Jane Austen novel (everyone should have at least one!!! ), and drink a cup of tea to celebrate and remember this extraordinary woman who is still so very much alive 200 years after her death on July 18, 1817. From films, tv shows, to new novels based on or inspired by her originals, the lovely Jane is very much present in our world. You can join a society and you don’t even have to live in the UK to do so … the Jane Austen Society of North America even has an Eastern Pennsylvania Region chapter. 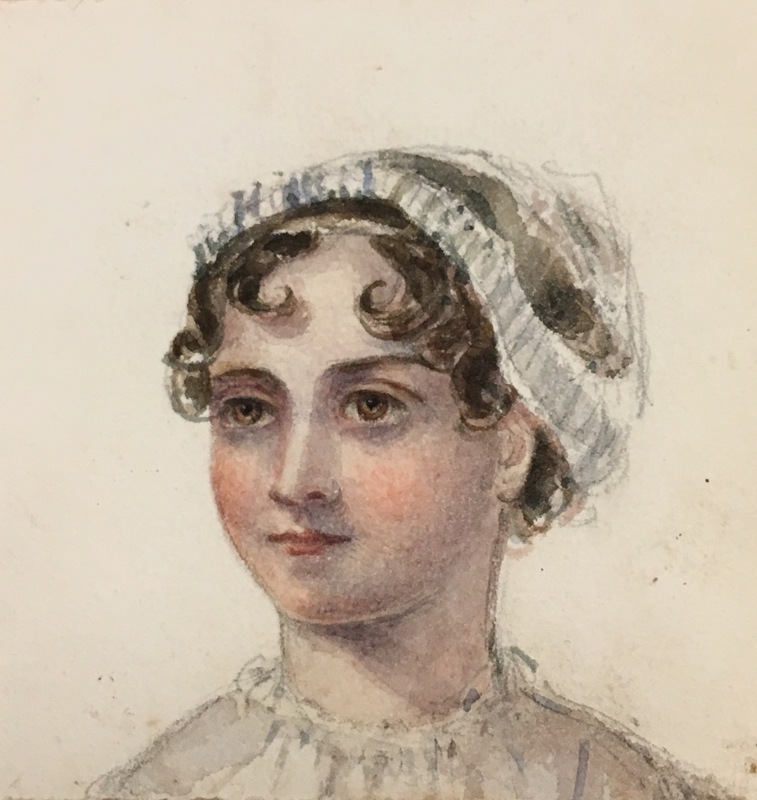 Here is a watercolor portrait, presumably of Jane Austen … we don’t know who painted it or when, but it was found in Volume I of a three-volume edition of Emma (London: J. Murray, 1816), held by the Kislak Center for Special Collections, Rare Books and Manuscripts. (call number: PR4034.E5 1816). The watercolor can be found in box 1, folder 35 in our Miscellaneous Manuscripts collection. In 1911 Una Nixson Hopkins published her only novel, A Winter Romance in Poppy Land (Boston: Richard G. Badger). Remembered now largely as an architect and interior designer, as well as a Hollywood art director, she was also a frequent contributer of articles and short stories to magazines like the Ladies’ Home Journal. The plot of A Winter Romance in Poppy Land is very much in the vein of such magazine fiction: George Oliver and June Winthrop, both visiting Pasadena, fall in love, but June rejects him when an overheard conversation suggests his complicity in a jewel theft from their hotel. Once June learns that Oliver is an aspiring playwright and the conversation concerned a plot twist in his latest work (the actual theft was a mere coincidence), she yields to his advances and the two announce their engagement. “An interesting love story with rather an unusual plot of misunderstandings,” concludes a contemporary reviewer in Out West, commending the book’s affectionately “vivid and true” depictions of its California settings (James 59). Frontispiece (featuring Julia S. Holmes and “our gardener John”) and title page of A Winter Romance in Poppy Land, previously owned by the Dewey family of Pasadena, Calif. The characters are all stock figures (distressingly so in the case of the African-American gardener, Japanese servants, and Hispanic locals), but when it came to choosing models for the photographic illustrations of her tale, Hopkins eschewed stock in favor of her Pasadena neighbors. Uncredited in the book itself, their identities are revealed in an eight-page manuscript tucked into the copy recently donated to the Penn Libraries by Caroline F. Schimmel as part of the Collection of Women in the American Wilderness. Amon g the volumes presented to the University of Pennsylvania Libraries by Caroline F. Schimmel as part of her Fiction Collection of Women in the American Wilderness is an inscribed copy of That Dakota Girl by Stella Gilman, a Western romance published in 1892 to tepid reviews: “The pony that always figures in stories of Western life is introduced in the initial chapter, and has its share to do with the love-making and various subordinate incidents. But the reader looks in vain for the genuine local coloring that is to be expected from the title” (Public Opinion 13 (1892): 487). Gilman, a resident of Hudson, South Dakota, is a shadowy figure; in the biographical note to her only other book, A Gumbo Lily and Other Tales, she writes that she was born in Philadelphia and emigrated with her family to the West as a child in 1878. 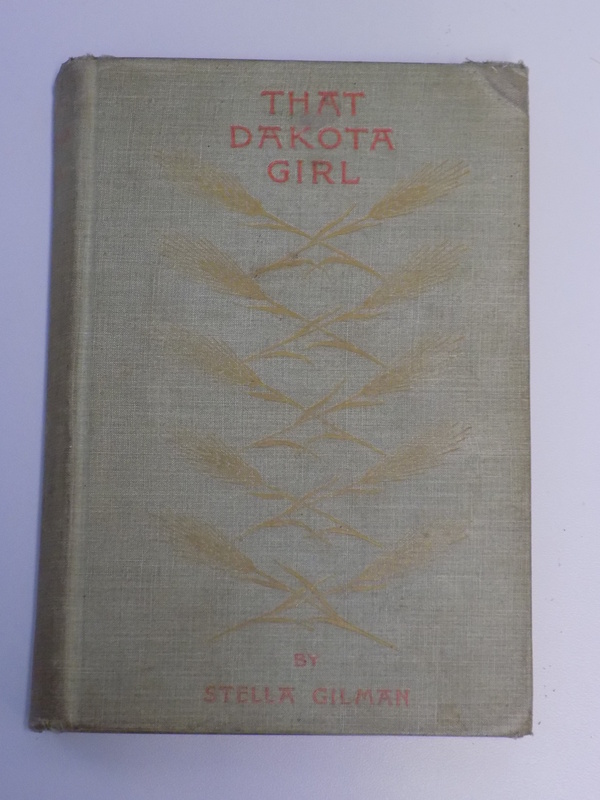 The Schimmel Fiction Collection copy of The Dakota Girl has a 19th-century gift inscription (“To Uncle Herbert, with The love of The Author. July 15. 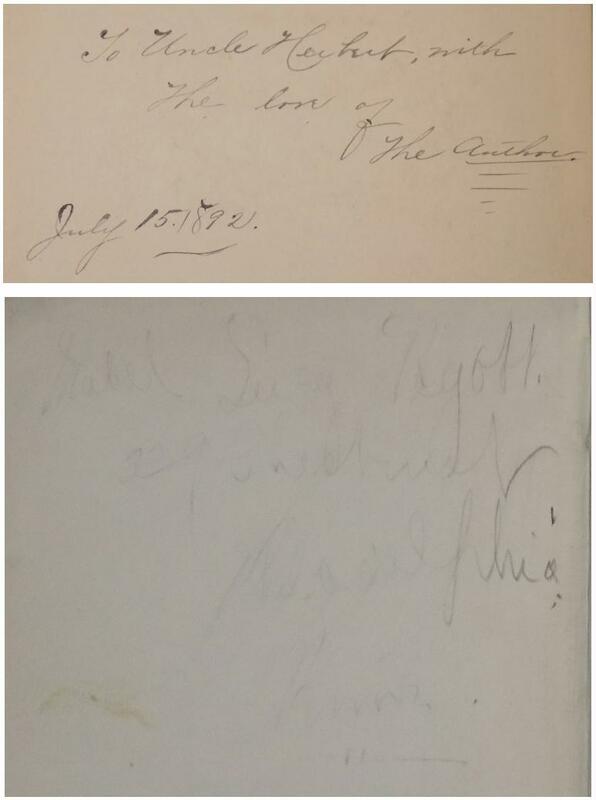 1892.”) on the front free endpaper and a partially effaced autograph in a childish hand (“Mabel Lucy Pegott [sic]. 329 Chestnut, Philadelphia, Penna.”) in pencil on the verso of the back free endpaper. Please join the rare book and manuscript catalogers of the Kislak Center for Special Collections, Rare Books and Manuscripts for “Cataloging Conflict,” one of a series of Archives Month Philly events celebrating archives and special collections in Philadelphia cultural institutions. “Cataloging Conflict” will be held on Thursday, October 16, 2014 at 5:30 pm in the Class of 1978 Orrery Pavilion of the Kislak Center. 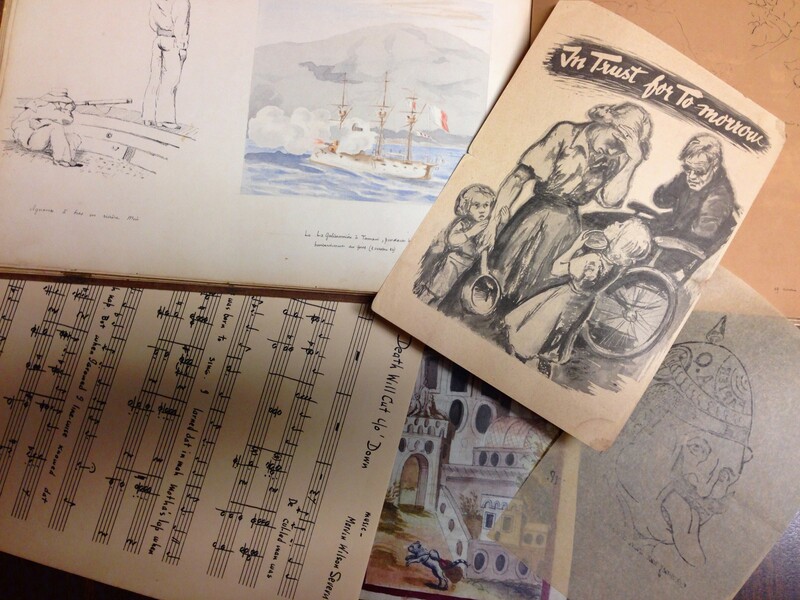 Inspired by the centenary of the start of World War I, Penn’s archivists and rare book catalogers have combed the Kislak Center special collections for a wide variety of materials documenting war and conflict through the ages. Their favorite finds, which will be on display for this special event, include war propaganda printed on toilet paper, engravings of the Trojan War sold by subscription to fund the 1660 printing of Homer’s Iliad, a spectacular manuscript roll depicting major figures in England’s Wars of the Roses, indulgences sold to raise money for papal armies, 16th-century woodcuts of bizarre inventions for siege-craft and underwater warfare, escape maps and blood chits, soldiers’ songs performed by Marian Anderson, hand-colored illustrations of war elephants, letters to and from soldiers in World Wars I and II, the diary of an American Civil War draft dodger and … Penn’s famous Rocket Cats! The Class of 1978 Orrery Pavilion is located in the Kislak Center for Special Collections, Rare Books and Manuscripts on the 6th floor of the University of Pennsylvania’s Van Pelt Library (3420 Walnut St, Philadelphia Pa. 19104). The event is free and open to the public. Please bring a photo ID to enter the building. Registration for this talk is appreciated but not required. Please RSVP here or contact us at rbml@pobox.upenn.edu or 215.898.7088. Cataloging this pamphlet turned up an extremely sad history involving the kidnapping of two children from El Salvador, nineteenth century conceptions of race and disability in America and Europe, and P. T. Barnum and the American circus freak show. 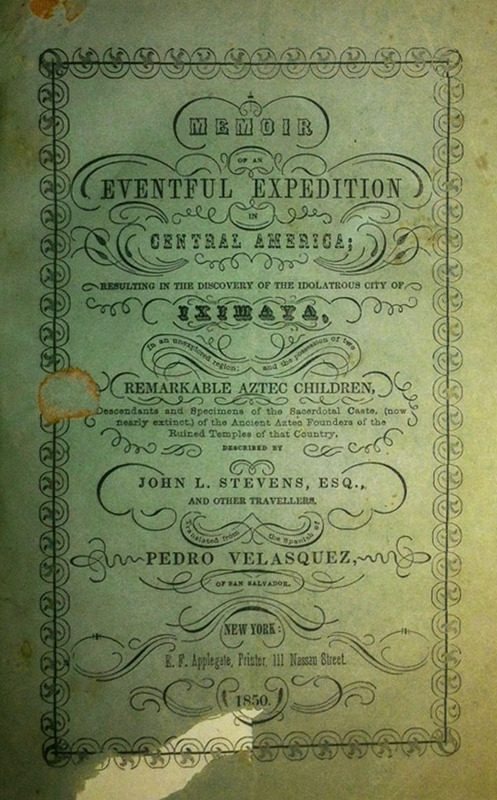 The pamphlet Memoir of an eventful expedition in Central America helps tell the story of the construction of racial and ethnic others during the period of the birth of American anthropology.